I am so excited about this block! 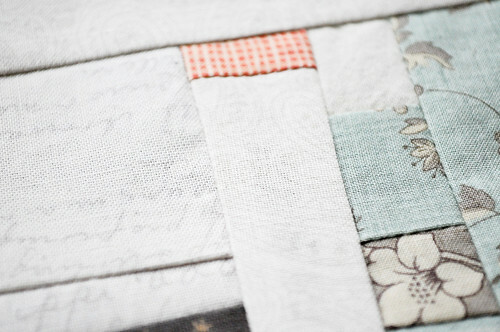 This is the second Patchwork Palettes block that I’ve done with Amanda. The concept of our project is that we draw colour inspiration from one of our Pinterest photos. The two of us each create a patchwork block that interprets the palette. One photo, two completely different blocks! This time it was my turn to choose and I HAD to choose this incredible photo of Iceland. These colours are so ME. 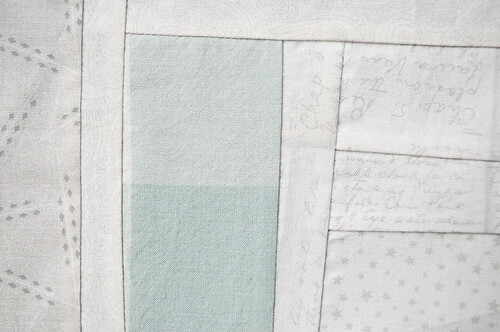 I loved looking through my scrap bin for these icy blues, smoky greys, bits of pink and black. You may recognize some scraps from my last Happy Homemade top. It was a ‘happy’ coincidence that I was working on both projects at the same time. That big gingham in aqua and white was a perfect fit for this. 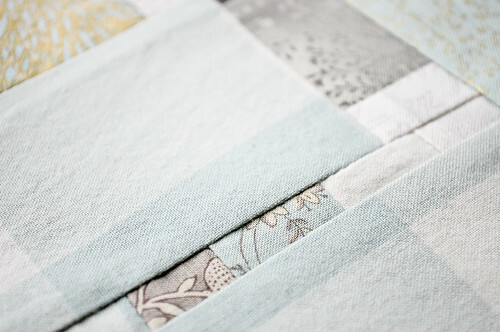 This block is loosely based on a log cabin pattern with lots of scrappy strips and bits mixed in. Some things that I love about this block : where I’ve pieced the same fabric to itself, the repetition of fabrics throughout the block and the tiny scrap of persimmon plaid fabric near the top right corner. Amanda also did an improv block this time and I absolutely love it! 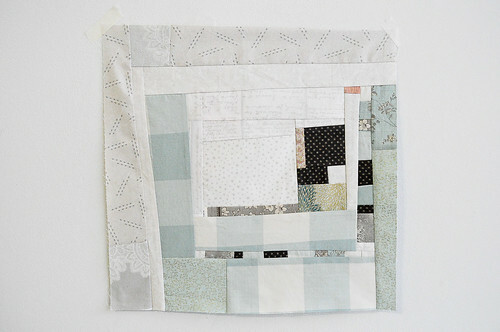 Take a look at her bold fabric choices and teeny tiny bits of piecing and stripes. So good. Also, my favourite detail is her little diagonal pieces. This project is so good for me. These small blocks are incredibly satisfying to make and I’m learning all kinds of wonderful ways of improv piecing fabrics together. It is an inspiring way to sew. Plus, testing out colour palettes is so much fun. I can’t wait to start on our next block. We’re off to choose our next photos!! I keep clicking on this post because I love your block SO much. It’s perfect!!! love how you and amanda came out with different interpretations of the same photo! loooove your colors. Love the idea! 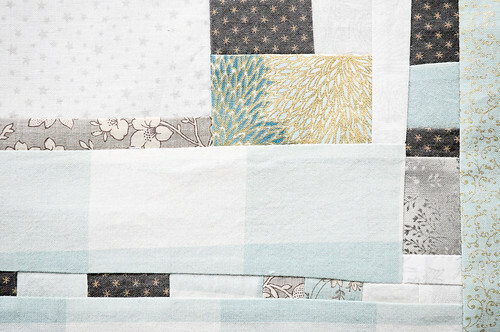 And of course the patchwork is so lovely. I love this block so much. The colors are perfect and the improv is wonderful. This is lovely. It makes me want to go to Iceland! This is beautiful! I love how subtle the colours are, but then you have the perfect little bits of black and persimmon that pop. And that photo is amazing! I was wondering if you carry the DMC Library Cross Stitch series at the Workroom? 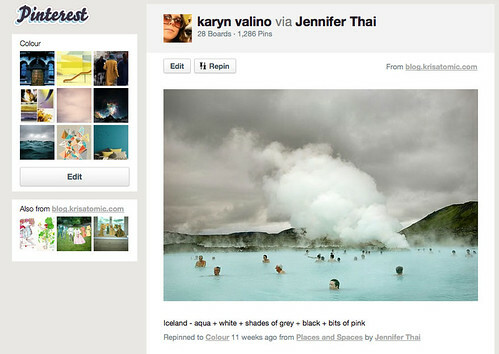 this is so so beautiful karyn – love the palette and composition. i agree – the colours are absolutely you! This is just gorgeous! And the colors are so beautiful. It is perfect! Love the 2 interpretations of this fabulous landscape. And love the idea of 2 different person interpreting the same picture. You both are amazing.